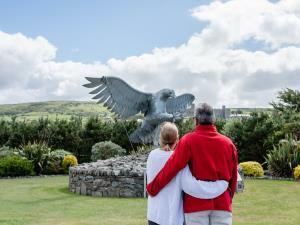 Touring & Motorhomes @ Min y Don01766 780286work Holiday & Touring ParkSet below the magnificent Harlech Castle, and only a few hundred yards from the spectacular sand dunes of Harlech beach, Min-y-Don is a caravan holiday home and touring park of the highest quality in an outstanding location. This immaculate park was completely rebuilt for the 2009 season, including tarmac roads, with electric hook-up, water supply and grey waste disposal to every pitch. We have available. The park achieved Platinum five star Loo of the Year award and take pride in keeping it to the highest standards.The facilities block offers showers, toilets, private bathrooms (extra charge), washing up and chemical toilet disposal facilities. Wifi internet access is available (subject to public access wifi terms and conditions). Your children will enjoy the large, well equipped play area complete with football pitch and grass bike track. Set below the magnificent Harlech Castle, and only a few hundred yards from the spectacular sand dunes of Harlech beach, Min-y-Don is a caravan holiday home and touring park of the highest quality in an outstanding location. Please note the park is for touring caravans and motorhomes only and cannot accept tents, trailer tents, folding campers/caravans do not have any seasonal pitches. Facilities include Platinum 'loo of year' award Children welcome from any age. Easily found by approaching Harlech on the A496. Turn off opposite Queen Hotel towards the beach and proceed for approximately 400 yards, Min-y-Don is located on your right.